In 1897, F. Lewis Clark a wealthy mining entrepreneur donated a substantial piece of property in the East Central to the city. The donation consisted of 21 acres of land to be used for a public park in the area. The donated land was bound by 3rd Avenue on the north, 5th Avenue on the south, Perry Street on the east, and Arthur Street on the west. Additions at this time had parks within them, but many were for the private use of residents of the particular addition. Aubrey L. White, the first Spokane Park Director, believed that wealthy men should give park land to the city. Previously, the city had to purchase park land for the general public. Other people donated park land as well, such as J.P. Graves who in 1903 donated 80 acres of more land to Montrose Park and changed the name to Manito Park. Most park donations had underlying goals as developers had hidden agendas. In order for the city to obtain the park land, the city had to agree to irrigate the park or agree to other concessions. In the case of Liberty Park, the city had to agree to grade the southern border, 5th Avenue, and invest $6,000 into the park over the next three years. Liberty Park was officially named in 1898 when 165 residents of the adjacent Liberty Place Addition signed a petition to name the park. That same year, Kirtland Cutter, a well-known Spokane architect donated the original park design. Spokane had no formal parks department at this time, and as a result some of Cutter’s original plan was an expensive undertaking for the time period. Cutter had originally suggested a waterfall run over one area of the high basalt cliffs. Although the waterfall was not completed, a small rock shelter near the small lake was finished and used during the winter months. The shelter provided a resting place for ice skaters and a fireplace for warmth. Later in 1908, while drafting the city’s first park plan, the Olmsted Brothers of Brookline, MA said that Liberty Park is “so much broken into hills and valleys with abrupt slopes and prominent projecting ledges that it is capable of uncommonly picturesque landscape gardening development.” The firm recommended a new design which included the planting of trees, a stone pergola with octagon shelters at either end, play areas for children and tennis courts. The redesign of Liberty Park was completed in 1913. 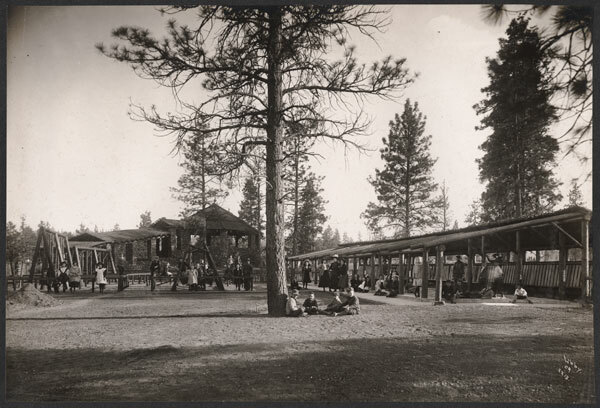 Liberty Park was a well-known attraction in Spokane like Natatorium Park and Manito Park. 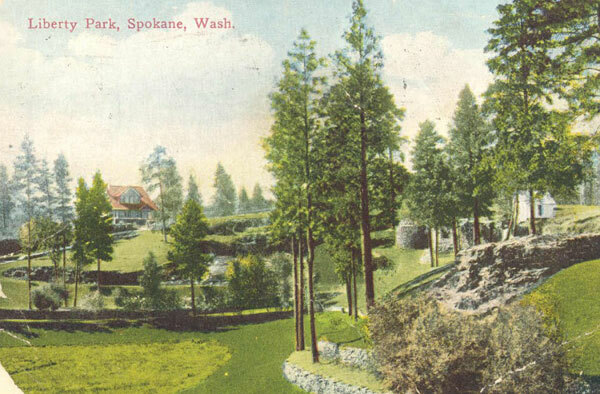 Numerous postcards, pictures and newspaper articles portray the sites of the park, establishing it as a widely recognized emblem of Spokane. The park had a dedicated streetcar which made visiting easier. 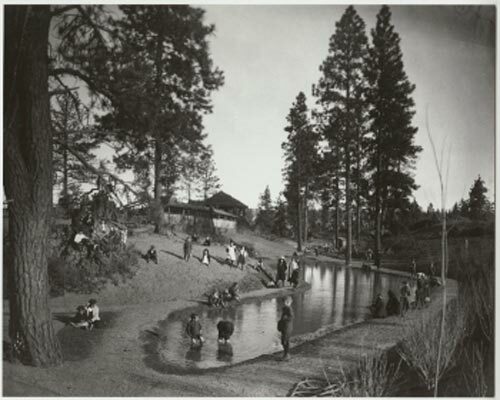 In 1920, the park boasted the first public pool in Spokane. Other than the pool, wading pools and playgrounds, Liberty Park drew crowds for its geographic diversity and natural beauty. Unfortunately, in the 1960’s, 19 of the park’s original 21 acres were sold to the Department of Transportation and the new interstate (I-90). The new interstate right-of-way essentially bisected the neighborhood, along with the beautiful park. Although the park was enlarged to the east, little of the parks original design and features were left. Today, all that is left of the original designs are disjointed trails of basalt and a section of basalt ruins northwest of the interstate. Neighborhood members tend to call the area Liberty Park Ruins or the Ruins of Liberty Park. The ruins can still be visited although they can be a little tricky to find.